3V PAULO Balloon Dilatation Catheter System (CE approved) aims at reducing the pre-dilatation process time and providing enhanced trackability across tortuous lesions. Its distinctive re-wrap capabilities allows for extensive repeat inflation/deflation of the balloon. It consists of proprietary hydrophilic coating which will enhance the performance, improve access for delivery and placement of endovascular devices. Significant reduction in the frictional force was observed when comparing hydrophilic coated and uncoated catheter shafts. Percutaneous Coronary Intervention is typically a three-step procedure. A tightly-folded balloon catheter is tracked through the blocked artery. Once the balloon is appropriately located within the blocked artery (i.e. lesion), it is inflated to a pre-fixed size using contrast liquid such as saline. The inflated balloon pushes aside the accumulated plaque (i.e. blockage), to the sides of the artery and thereby re-opens the narrowed artery. The last step involves deflating the balloon, followed by retracting the catheter to restore blood flow. 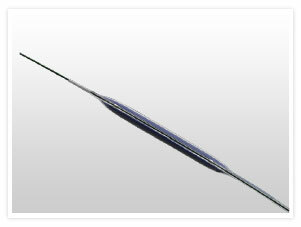 The 3V PAULO Balloon Catheter is designed on a Rapid Exchange (RX) delivery platform, which allows for greater physician control, excellent shaft performance and reduced fluoroscopy time. The ultra-low profile 3V PAULO was designed to enhance lesion access and allow for 6F-Kissing Balloon Technique. Enhanced Crossability and Recrossability: Flexible tapered tip and lowest lesion entry profile (0.016”), allows for crossing tight occlusions. Comprehensive size matrix: Designed to track through a wide variety of complex lesions, the 3V Paulo balloon catheter is offered in the following sizes: 1.50 - 5.00 mm low profile balloons. Excellent Pushability: Enhanced push force and efficiency, due to excellent shaft column strength. Zero device slippage:As a result of excellent radiopacity, accurate placement and excellent lock-in technology. Lock-in technology fixes the catheter tightly in place leaving zero space for slippage. Uniform luminal enlargement: Resulting in accurate inflation/deflation and optimal long-term results. Backed by unmatched technical attributes and quality standards, S3V Vascular’s 3V PAULO Balloon dilatation catheter system creates a new benchmark for Balloon Angioplasties.